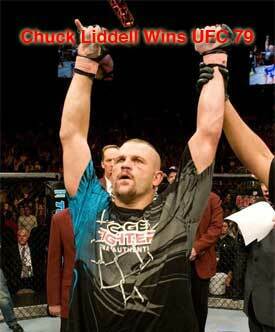 UFC 79 NEMESIS Chuck Liddell is winner over Wanderlei Silva by unanimous decision. 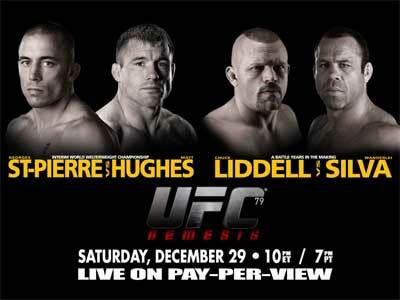 UFC 79 pay per view event also had Georges St Pierre winner over Matt Hughes by submission. All of the mixed martial arts excitement in the Octagon took place Dec 29, in the Mandalay Bay Events Center in Las Vegas, Nevada real estate. After six years of waiting for this fight it lived up to everyone’s expectations. Liddell was the winner in a three round unanimous decision. The former UFC Light Heavyweight Champion had a score of 30-27 twice and 29-28. He stopped his losing streak over the former PRIDE Champion. UFC 79 NEMESIS Liddell vs Silva will be held Dec 29, 2007 at Mandalay Bay Las Vegas. Wanderlei Silva hasn’t fought for the UFC in seven years. The crowd was excited and showed their enthusiasm with a roar as the weigh ins happened. “The Axe Murderer” ripped off his shirt during the staredown and showed the crowd he was ready for this fight. UFC 79 NEMESIS Chuck Liddell vs Wanderlei Silva will be held in the Mandalay Bay Events Center Dec. 29, 2007. This is a long anticipated matchup in the Octagon between Chuck “The Iceman” Liddell and “The Axe Murder” Wanderlei Silva said Dana White, The Ultimate Fighting Championship President. Both mixed martial arts fighters have waited a long time for this important fight in addition to the eager fans, too. Silva is from PRIDE fighting and Liddell is the most dangerous striker in the UFC.